Images & Text © Copyrighted 2013 All Rights Reserved - Really Big Coloring Books® , Inc.
Saint Louis, Missouri is home to a world leading Coloring Book Manufacturer known as Really Big Coloring Books ®, Inc., (RBCB) in business since the early 1980's. The namesake and idea was founded by Wayne Bell. Really Big Coloring Books ®, Inc. trademarks are registered and have grown from the original published book to hundreds of titles in print while producing millions of copies each year. The company owns over 700 coloring (colouring) book related domain names in several countries including Canada, the United Kingdom and Europe. Really Big Coloring Books ®, Inc. creates coloring book products of various sizes and topics for retail, educational, fundraising, promotional channels and specialty coloring books for groups, business and individuals. With success in the fundraising markets among groups, clubs, schools and businesses in the late 1980's, the advent and growth of the internet has helped establish Really Big Coloring Books ® , Inc. as a global presence in the coloring book industry. Appearing in media internationally and shipping throughout the world to numerous countries RBCB has published books in several languages from English, German, Spanish, Japanese, Gugarati, Italian, Russian and French to name but a few. 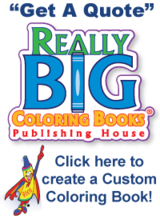 The Really Big Coloring Books ® (RBCB) product lines are wholesale priced, high quality, American manufactured materials. RBCB employs Union and non-union manufacturing and does not offer, closeouts, over-runs, leftovers or cheaply made imports that are dumped into the North American markets. With a sharp emphasis on customer service and satisfaction, commitment to employees and clients alike, the company has a strong passion for professionally built quality books for children. Every unit published is reviewed by an editor for content, style and message. RBCB products come with ISBN numbers and are registered into the Library of Congress with © Copyright and ® Trademark protection. Educators, parents, teachers, the advertising specialty markets and of course children love RBCB products, while authors, media, politicians, local business, corporations, librarians, self publishers and the book industry as a whole demand excellence in publishing. RBCB is happy and motivated to be a part of the industry and to provide jobs for workers in North America and beyond. They encourage feedback on products from customers and critics alike and strive to provide a good value and quality books for their readers. The Really Big Coloring Book ® brand name has become an established high standard of the coloring book publishing industry and they are known for their market leading positions. RBCB'S family of trademarked products are classic, colorful and unique. The company products are multicultural, multilingual and representative of all people. The company uses soy based inks, prints on recycled paper and they participate in Sustainable Forestry Initiatives. Visit www.ColoringBook.com for custom, retail or promotional coloring book ideas! Images & Text © Copyrighted 2018 All Rights Reserved - Really Big Coloring Books ® , Inc.